Leading Manufacturer of gym dumbbells and weight plates from New Delhi. We offer our clients with Weight Gym Dumbbells which is a piece of equipment that is used in weight training and a type of free weight. This is made out of high quality of iron and we offer then in a cost effective price. As fitness has become the prime concern in this world, our company’s Dumbbells are very much high on demand and are widely used by many in the field of fitness. 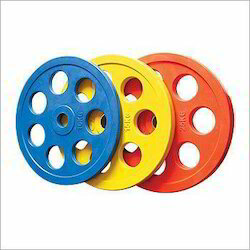 We produce different type of Weights Plates for the purpose of personal gym. Weight plates are mostly found in gyms and standard weight plates are mostly found in homes gym and Olympic weight plates and standard weight plates get attached to barbells or weight machines to help build strength, muscle.